We are so excited to have this doe. We were lucky to be around when the Blomquists decided to sell her. She not only is a 5* milker, that she earned at a one day test in September after being at the fair for three days prior and in heat, but she also has a National show record. We can't wait to continue to show her and see how she does. We are also really excited to see how she does this year on milk test. With more freshenings, we can only hope to see her do better and better in the ring. Not to mention the babies to come. Vanessa is obviously a very correct doe with great show presence. She stands on strong legs with a very capacious udder and great depth for a first freshener. Like I said before, we just can't wait to see what her future holds. Vanessa kidded with 2 bucks and a doe. We are excited to have a doe kid from her to freshen. 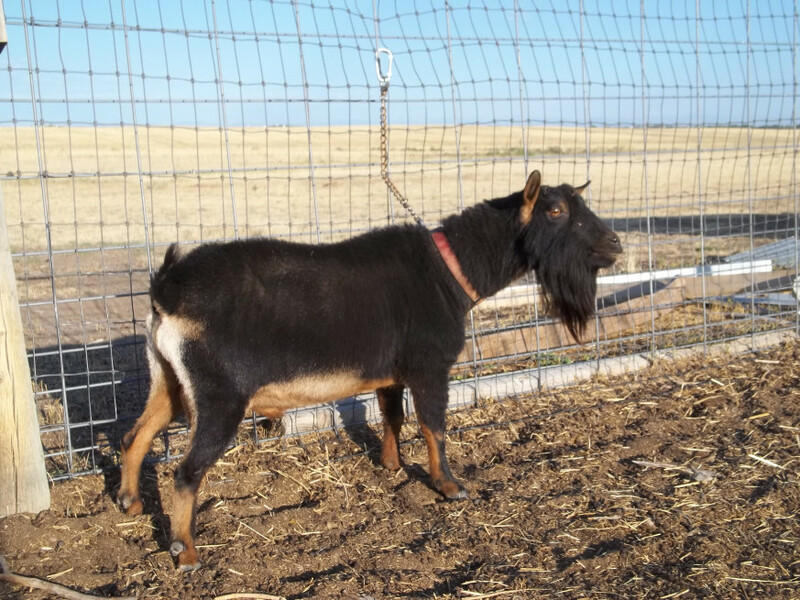 Her daughter Selena already has the length and general appearance of her dam. Vanessa like last year steadily gives us around 4 lbs a day in milk. 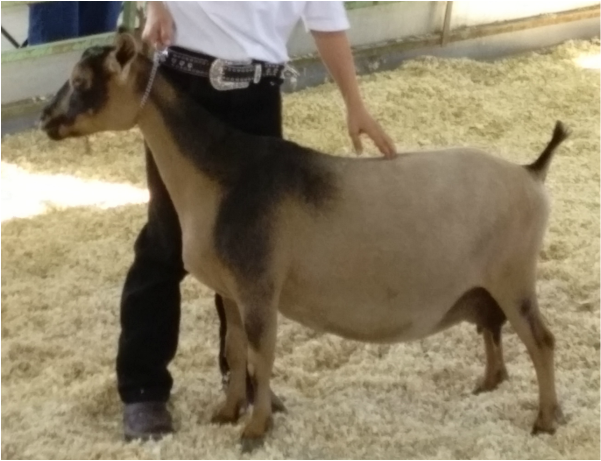 We are so excited to announce that after winning Grand Champion in all four rings at the Utah State Fair, Vanessa is now a pending permanent champion. She is also milking like a trooper this year and is just under 4# a day at 7 1/2 months fresh and having traveled to four shows this summer. We are excited to see her milk testing numbers this winter. Vanessa has also proven to pass on her beautiful conformation. 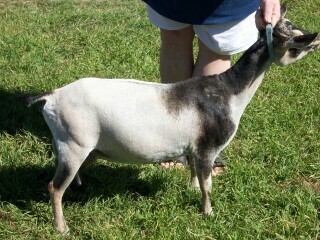 Her doeling from this year is a 2x Grand champion junior doe. We can't wait to see her fresh next spring. What a year for Vanessa. This fall she scored a 90 on her LA as well. She has been bred to Pilot for a mid March kidding. This definitely wasn't a good year for Vanessa. 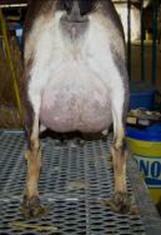 First she freshened with twin bucks, and then developed a case of mastitis that forced us to dry her off. We hope she will freshen next spring in better form. The summer off didn't do her harm, and she seems happy and healthy. Vanessa spent the summer at home this year and raised her first set of buck kids. She kidded with triplets with two bucks and one doe. Unfortunately we lost the doe kid in the fall. Vanessa didn't settle last fall as we had hoped, so spent the summer as a pasture ornament. 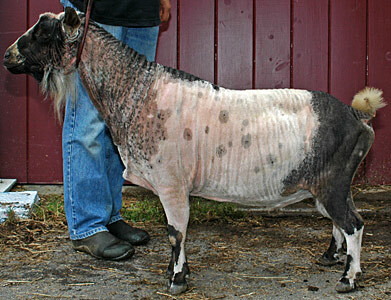 She has been bred this fall to Clover for March kids. Sadly we lost Vanessa this spring to kidding complications. She will be missed very much. She has left us a lovely buck kid, and we plan on keeping him for now. 2012 Nationals. 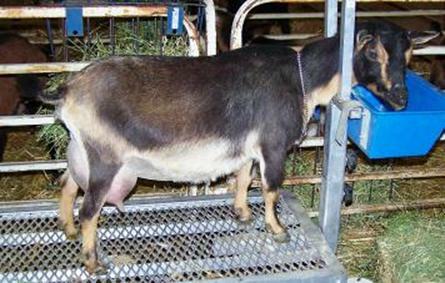 Photo courstesy of RMA Dairy goats. First Show with us. Won reserve. 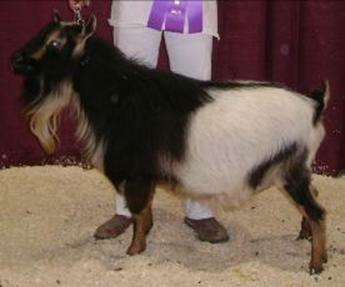 Reserve Grand Champion as a first freshener at Utah State Fair.